The following post is written by our dear friend and long-time collaborator Vanessa Reid. We originally got to know Vanessa through our work at Santropol Roulant, during her time as executive director, work that has since expanded and evolved into a 10-year (and counting) conversation. Her reflections in this post have sparked an e-dialogue between the three of us about how to put the concept of ‘field work’ into practice. What does it mean to work in the-day-to day with the larger, invisible patterns and connections that shape our work? How do we engage with these fields in a concrete way: in the middle of planning meetings; as we undertake our routine acts of service or advocacy? We will be posting excerpts from our conversation as it unfolds. i am part of what feels like a new kind of team-work – it’s not so much that we are working as a team, but more as a “Field.” We call ourselves the “Amoeba”, and we work in partnership with others in large-scale systemic transformation processes- for example, the Finance Innovation Lab and Tasting the Future. what is showing up is actually that one of the really important innovations towards systemic change could actually be our ‘Field”, this way of working together. moving from a Team to a “Field” has something to do with working very intentionally with a much wider and deeper system of intelligence – it includes the more energetic infrastructures, the invisible, unconscious and well, things that we just don’t always have names for. in coming together with a certain quality of intention and attention, we can access a collective intelligence otherwise unavailable to us on our own. these energetic and magnetic fields can significantly shift or deepen our awareness or actions which can result in more intelligent, just, compassionate and wise actions in service to people and planet. it strikes me that knowing how to work with fields, and the multiple forms of intelligence available to us, is necessary if we are to truly do work that is systemic. there is a lot of talk about shifting our unsustainable systems, but if we do not know how to access deeper intelligences and integrate all aspects of life into our view, then we are only working with a small part of what is there. we need to learn to work with the whole system. this is the new kind of “field work”. working with a field cultivates a collective resonance which is described as “the “magic’ that transforms individuals and whole groups through access to greater sources of wisdom.” synchronicity, as coined by Jung, is also an example of fieldwork, as it results “from becoming linked with the environment in a special way, anticipating events or sensing some underlying pattern to the world.” there are many examples in different spiritual practices, in systemic or family constellation work, in being in “the flow” whereby the connection between people, place and “the invisible” create conditions for us to be more attuned, intelligent and wise. 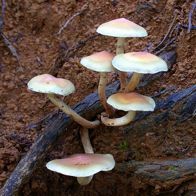 author Paul Stamets who wrote Mycelium Running: How Mushrooms Can Help Save the World believes mycelium, which bear mushrooms as their fruit, have not just the ability to protect the environment but the intelligence to do so on purpose. in an interview with Derrick Jensen in the Sun magazine called going underground, Stamets describes how the invisible and underground systems of fungi work to nourish the whole and how they transmit information across their huge networks. it intrigues me to think that this network that is so alive and essential to life decided to do its work underground. it is this invisible work – at least it is invisible to us topsoil folks – that sustains life on the planet. what are the invisible and underground networks working on our behalf, both those that sustain us and those we humans create and sustain? Jungian psychology describes a collective unconscious that lives alongside and within us, it is available when we accept our whole selves through our shadows, our dreams, our inter-connectivity with our lineage, and the inter-generational transmission of consciousness. indigenous peoples and traditions work with the invisible in many ways, bringing in ancestors, plant-spirits, and the cycles of life and death such that all life and time is present at all times. this information – this community – is accessible to us if we invite it in and work with it, if we see it as real and tangible. resonance and fieldwork are practices of cultivating consciousness as something real, tangible, accessible. working with such fields helps us host the evolution of our humanity. access this, and more of life is available to us. so what kind of partnerships can and must we form with the invisible networks of life? what are the practices that bring in the multiple levels of intelligence that are just waiting to be invited to the party? how would our organizations, communities, institutions be different if we saw the wholeness of integrating the visible and the invisible?